Florida Gators head football coach, Urban Meyer, stepped down today citing the immediate need to place health, faith, and family first. Less than a week before his Florida Gators play in the Sugar Bowl, Meyer announces his intent to resign from the university. And you thought college football wasn't exciting? Easily the most shocking news of the college football season, Meyer's departure from Florida will indeed send shock waves through college football. Much like Michael retiring from basketball for the first time in 1993, Urban Meyer's exit has major impacts on the sport that is college football. (1) It is THE PREMIER coaching job in college football. In Meyer's five seasons in Gainesville, he has not only brought the Gators back to where they were under former head coach Steve Spurrier, but he's surpassed that. Two BCS National Championships, three SEC East titles, and a 56-10 record over that run. You and I would be hard pressed to find a coach with a more impressive resume in the past five seasons. Would former Cincinnati head coach and newly anointed Notre Dame head coach, Brian Kelly, have accepted the Irish job with Gainesville open? Would former Florida State head coach and living legend Bobby Bowden have been asked to leave after this season had Meyer already departed? 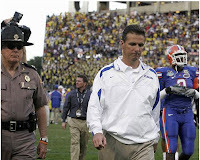 Don't you think some Florida native athletes would be lured by Bobby with Meyer stepping down? Would Louisville still be coach searching had former Florida defensive coordinator, Charlie Strong, caught wind of Meyer's plans? In the football rich state of Florida, with a winning program setting records in Gainesville, no school can boast that they are the College Football coaching Mecca, as Florida can. The Gator opening becomes coaching destination #1. With Urban Meyer leaving enormous shoes to fill. (2) Provided Urban takes a year off, when do the Jacksonville rumours start? An NFL franchise in the Sunshine State which has seen it's stadium empty weeks after weeks, rumours already floating about the possible acquisition of Florida's adopted son Tim Tebow via the NFL draft. Could a successful college coach yet again take off for the NFL? 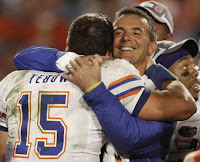 Wouldn't an Urban Meyer and Tim Tebow reunion in the state which they succeeded so much be story number one of the offseason? Urban Meyer could take a year and relax, reevaluate his health, then return to what he loves doing, coaching. It doesn't seem a little strange that Meyer would want a break while he mulls the NFL? I am one for conspiracies, but to see these two reunite healthy at the next level, would be fantastic theater. NO matter what the future holds for football coach Urban Meyer and the University of Florida, today we should have no doubt that he is and will be one of the finest coaches the game has ever seen in such a small window. Like Barry Sanders in Detroit or Jim Brown in Cleveland, Urban Meyer is an amazing college football story. Chomp, Chomp!